I was born in a Catholic family. Since I was little, I attended Mass at church with my grandparents. Due to the influence of my environment and my belief in God, I learned to chant many different scriptures and practice various rituals. In 2009, I arrived in Japan to study. One time, in a fellow student’s dorm room, I met by chance a Christian small group leader who had come to spread the gospel. I thought: Protestants and Catholics believe in the same God. They both believe in the Lord Jesus. As a result, I accepted the small group leader’s invitation to join him at the church. After listening to the pastors preach and hearing some brothers and sisters talk about the Bible, I had some understanding about the Lord Jesus’ life. This caused me to have more faith in the Lord. However, after a few months, the pastors and the preachers asked us to donate tithe every week. Also, each week, we were to hand out pamphlets to spread the gospel. Sometimes, we were so tired that we would snooze during Sunday service. We no longer had a normal routine in our life. At that time, some of us were both working and studying. Not only did we have to make money to pay for our studies, but we also needed money for our everyday expenses. Our lives were already quite difficult, but they still wanted us to give them our money and our energy. We were under a lot of stress and pain. Gradually, I discovered that the pastors and the preachers were not truly people that served the Lord. Normally, since they were those who shepherded the church, they should have been helping us grow in our spiritual lives. However, they did not care about our lives. They did not think at all about our practical problems. Instead, they wanted our energy and our money. Everything they did was to help expand their church and consolidate their status and their influence. At this time, we felt like we had been deceived. Consequently, a few of my brothers and I left the church. After leaving the church, I found a Catholic church that was situated at the top of a mountain. The people in the church were Japanese. I attended Mass a few times but I felt that it did not benefit me spiritually. Additionally, it was inconvenient to attend fellowship, so I left the church also. In this way, I led a muddleheaded and empty life devoid of direction and a sense of purpose. … This happened all the way until October, 2016. Sister Liang, who I had met in the Protestant church in the past, suddenly contacted me, asked how I was doing and invited me to see her. I thought about how disappointing my experience with the Protestant church in that one year had been and as a result, I rejected Sister Liang’s invitation. However, Sister Liang invited me again and again and out of respect for her feelings, I decided to meet her. Through Sister Liang, I met Sister Ma and Sister Fang. One day, they spoke to me about a lot of the prophecies of the Bible. They told me about the work of Jehovah God and the Lord Jesus. Their understanding was very fresh and they talked about things that I had never heard before. I told them about the dark situation that I witnessed in the church and how I was so frustrated with my inability to obtain spiritual nourishment from the church that I was no longer willing to attend meetings. Sister Fang said: We have also experienced what you have experienced. Presently, the entire religious world is in a dark and desolate situation. Within this, there is God’s intentions and truth to seek. Presently, we are in the world’s final times. The Lord Jesus predicted: “And because iniquity shall abound, the love of many shall wax cold” (Mat 24:12). Iniquity is more and more prevalent in the religious world these days. The pastors and the elders do not follow the Lord’s teachings and they do not obey His commands. They only preach and work for their status. They always exalt themselves and bear witness to themselves so that other people will look up to them and worship them. They make other people donate and spread the gospel. Nominally, they say their purpose is to save people’s souls, but in reality, they do not lead people to experience the Lord’s words nor do they help people put the Lord’s words into action. They only want other people to obey them. They are itching to have other people treat them as God. Long ago they started walking on the path of the antichrist which is hostile to God. They have lost the Holy Spirit’s work and they have been abandoned by God. Think back to the late period during the Age of Law when the temple was desolated and had become a den of thieves. Priests made inferior offerings while the common people exchanged money and sold oxen, sheep and doves within the temple. But God’s discipline and punishment did not fall upon them. Why is this? The chief priests, scribes and Pharisees who served God did not obey the law, were hypocritical and deceived people, and had led God’s chosen people onto the path of resisting God. This led to God detesting and rejecting them and the temple losing the work of the Holy Spirit and becoming a den of thieves. In order to save people from being convicted to death by the law, God was incarnated for the first time, did the work of redemption under the name of Jesus, started the Age of Grace and concluded the Age of Law. The work of the Holy Spirit thereupon shifted onto the people who accepted the Lord Jesus. The temple no longer had the Holy Spirit’s work. In present times, the Lord Jesus has returned as predicted. He has already come back in the flesh. He is Almighty God, Christ in the last days and has started to express the truth and do the work of judgment starting with God’s family. The Holy Spirit’s work has shifted onto those who have accepted the work of God of the last days. Since the religious world has not kept pace with God’s work and many pastors and elders convict and resist God’s new work, this has led to God hating and cursing them. This is the source of the religious world’s darkness and desolation. Afterward, the sisters read a passage of God’s words so that I would have a clear understanding. Precisely because God has once again done new work, the Holy Spirit’s work has shifted. All the sects that do not have the Holy Spirit’s work become more and more dark and desolate. Almighty God said: “His work in other places will cease, and people will be forced to seek the true way. It will be like Joseph: Everyone came to him for food, and bowed down to him, for he had things to eat. In order to avoid famine people will be forced to seek the true way. The entire religious community is starving, and only the God of today is the wellspring of living water, possessed of the ever-flowing wellspring provided for the enjoyment of man, and people will come and depend on Him. That will be the time when the deeds of God are revealed, and God is glorified; all people throughout the universe will worship this unremarkable ‘man.’ Will this not be the day of God’s glory?” (“The Millennial Kingdom Has Arrived” in The Word Appears in the Flesh). 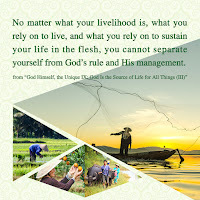 When I recalled the situation that I saw in Protestantism and Catholicism, it was further confirmed in my heart that the words of Almighty God spoke of the actual situation. His words are very realistic and true. The Holy Spirit’s work has indeed shifted. Regardless if it was in Protestantism or Catholicism, what I had felt was just people’s external passion. What I learnt was just scriptural knowledge and theological theories. There basically was no new light nor did I feel any spiritual supply of life. Among people who genuinely follow God, who hasn’t wanted to obtain spiritual nourishment? I saw that the words of Almighty God are capable of breaking my shackles and opening up the mysteries of the Bible. His words illuminated my heart. My heart was no longer bewildered. I have truly gained many benefits! At this point, I felt that God’s work was very fantastic, almighty and wise. I also felt the care and thought God had put into saving mankind who has been corrupted deeply by Satan and God’s great love for us! Almighty God’s words shed light on these truths and mysteries that I had never heard of. My horizons were truly expanded and I gained a lot. I decided to examine carefully Almighty God’s work of the last days. Another witness continued to speak: “Brothers and sisters, this atheistic political regime and the majority of the leaders of the religious world are satanic forces that hate God and the truth. This has already been confirmed by the fact that the Lord Jesus was nailed to the cross. That is why the true way will always face the rejection and conviction of atheistic political regime and the religious world. Moreover, all those who spread the true way and put the truth into practice will be framed and coerced by them as well. This is just as the Lord Jesus said, ‘If the world hate you, you know that it hated me before it hated you. If you were of the world, the world would love his own: but because you are not of the world, but I have chosen you out of the world, therefore the world hates you’ (Jhn 15:18-19). It is for this very reason that throughout generations, those who can accept the true way and follow the true God are only a very small minority who love the truth and pursue the truth. However, the majority of people do not dare examine the true way and as a result, lose the opportunity of God’s salvation because they follow Satan’s force or are afraid of being persecuted. That is why the Lord Jesus warned previously: ‘Enter you in at the strait gate: for wide is the gate, and broad is the way, that leads to destruction, and many there be which go in thereat: Because strait is the gate, and narrow is the way, which leads to life, and few there be that find it’ (Mat 7:13-14).” When I saw these things in the video, I felt even more certain that what the CCP government persecutes and convicts is in fact the true way. This is for sure. 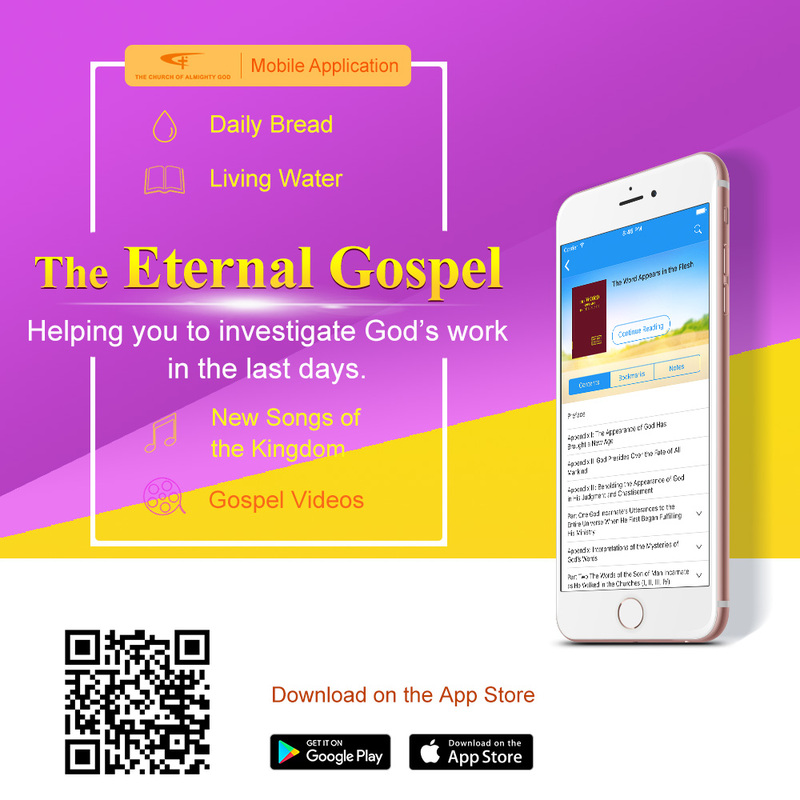 After a period of gathering and investigation, I had a deeper understanding of God’s judgment work of the last days from Almighty God’s words and the sharing and communication of the brothers and sisters. I also gained an understanding of the truth concerning incarnation, salvation and full salvation, God’s purpose of managing mankind, mankind’s end and destination and the originals of the way of eternal life. The truths that Almighty God has expressed are very abundant. From within my heart, I believed firmly that Almighty God is indeed the second coming of the Lord Jesus. I cheerfully accepted Almighty God’s work of the last days. I have persevered in praying daily and reading God’s words. Now and then, I also listened to the sermons and fellowship on entry into life and hymns of God’s words and I watched gospel videos. Every week, I gathered with my brothers and sisters and proactively spread the gospel and bore witness to God together with them. I feel that my life right now is very rich and my spiritual life has been nourished and is enjoyable. Finally, I have returned to the true church and I have found my true “family.” In the past, the churches that I used to go to had pastors and priests that needed to be addressed. However, in the Church of Almighty God, my brothers, sisters, and I all honor God as great. Our relationship with one another is not differentiated according to status. Everyone is equal. There are also no regulations or religious rituals during these gatherings. You can attend according to your own needs and time. Nobody will restrict you or force you. What everyone communicates about is how to seek to become an honest person, how to seek for a change in one’s disposition to obtain cleansing and salvation, how to fulfill one’s duties in order to repay God’s love and to satisfy God, etc. Unconsciously, under the guidance of God’s words, I also started to seek a change in my disposition and view things according to God’s words; I also had some understanding of and knew how to distinguish the evil essence of society’s tide and the methods and ways that Satan corrupts man. From then on, I no longer played video games nor did I waste time by going to KTV. When I had time, I would read God’s words or I would gather with my brothers and sisters for fellowship where we would sing and praise God. Each day was abundant. I no longer felt empty and helpless. Moreover, I was clear about my life goals. I knew that meaning was to be found through fulfilling one’s own duties before God and living for God as one of His creations. I am thankful to Almighty God for guiding me to walk upon the proper path of life. I am willing to place all the authority, glory and praise at the feet of the one true God, from now until forever. Amen!